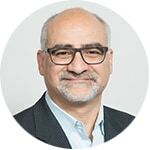 A challenge that those of us in product management and development wrestle with daily is continually pushing the rate of innovation of PureCloud. One of the most powerful ways to do this is through technology partnerships. By leveraging marketplace vendors with existing solutions, we can integrate with and build inline experiences on top of the PureCloud platform. Client Applications, a recent feature addition to PureCloud, creates the opportunity for third-party vendors to place their applications inside PureCloud for better agent experiences. It might sound corny, but it’s a 1 + 1 = 3 scenario. Since launching the beta of this feature, we already have a dozen vendors in active development. And some of these vendors have released third-party integrations that run seamlessly inside PureCloud. Each of the early adopter vendors leverages the PureCloud public API for customer data, single sign-on for authentication and the PureCloud user interface to embed their apps. One Genesys partner, nGuvu, pushes the envelope of our Client Applications feature with their cloud service nGagement. 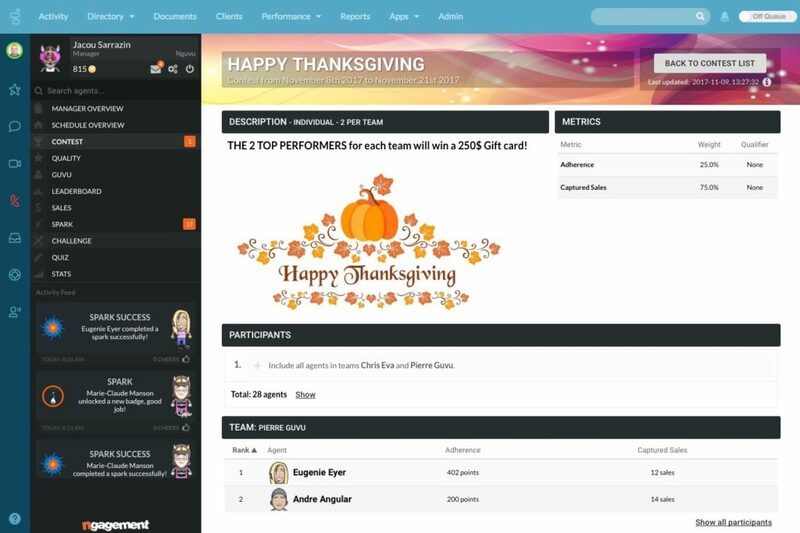 The nGagement platform brings social media concepts, gamification and known-performance drivers to build intrinsic motivation to influence contact center agent behavior in ways that increase their levels of engagement and optimize team performance. 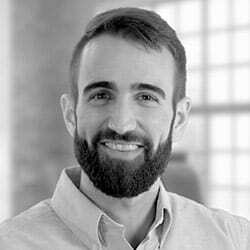 The platform achieves positive behavior modification by rewarding positive KPIs, promoting healthy competition, and enabling peer and company-wide recognition. What distinguishes nGagement as an integration for PureCloud is how easy it is to implement and begin experiencing value. This is all possible through the PureCloud public APIs; nGagement uses the APIs to create a frictionless installation experience so you can configure your first nGagement contest immediately. Here’s how it works. The first time the application is launched within PureCloud, the administrator is guided through the initial configuration flow. Although all the required permissions and syncing configurations are handled automatically, the user interface (UI) explains each step for the sake of transparency. Creating the new roles, groups, OAuth application and permissions occurs within a matter of seconds, enabling you to adopt nGagement rapidly. 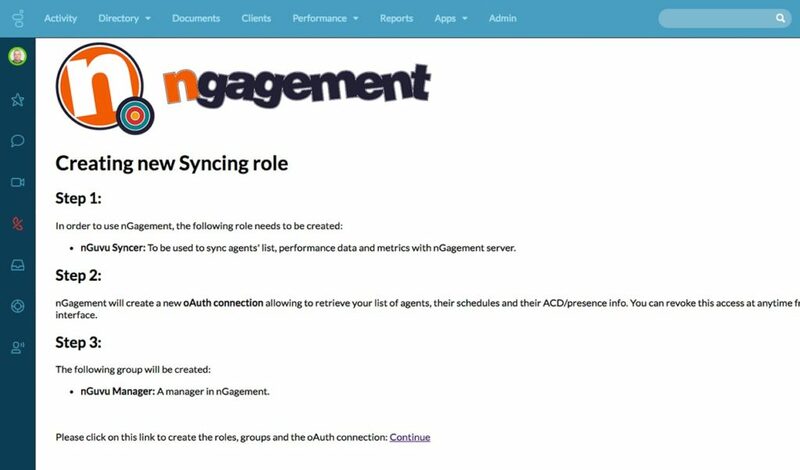 After completing this step, nGagement dynamically grabs performance metrics, such as Average Handle Time (AHT), talk time, agent on queue time, agent interaction time and agent schedules. Once the initial setup is complete, the administrator is guided through the user and group configuration synchronization between nGagement and PureCloud. 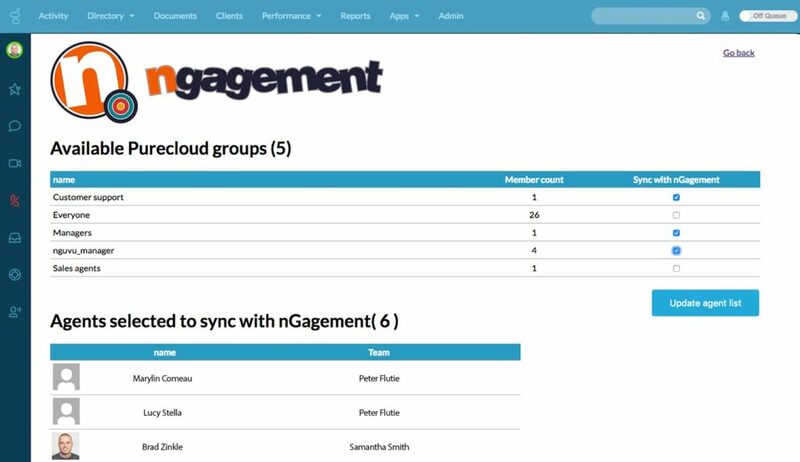 Next, nGagement can dynamically provision and update nGagement users from within the PureCloud administration screens. It’s simple to use nGagement. PureCloud users that launch nGagement are logged in automatically via single sign-on. As users interact with PureCloud throughout their day, they see their progress reflected in nGagement, thanks to real-time syncing. 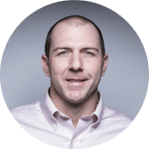 The leaderboard, challenges, evaluations, and contests are continuously updated with actual agent performance. The user experience of nGagement inside PureCloud is seamless—from install to daily use. The initial installation, data transfer, data mapping, configuration and testing of nGagement in a traditional on-premise environment can vary from a couple weeks to longer. By leveraging the PureCloud public API, nGuvu reduced that entire flow to just minutes. For customers looking to increase agent performance, this means time to value on the nGagement platform is fast. Overall, customers will benefit from expanded capabilities through vendor innovation. In 2018, the rate of integrations and extensions available for use in conjunction with PureCloud will increase. Now, next-generation cloud platforms automate once costly and timely installation tasks. Customers can begin to experience value at a pace not seen before in the contact center industry. Genesys will launch AppFoundry for PureCloud to facilitate click-to-install experiences of free add-ons and integrations for the platform. A marketplace of integrations, including nGagement, are called Premium Applications, and will be available for purchase from Genesys or directly from the vendor. Customers also can contribute to the community of add-ons and integrations available within AppFoundry. The functionality of AppFoundry will expand to facilitate the ability to purchase Premium Applications to seamlessly acquire new capabilities for your contact center. Watch for the PureCloud AppFoundry release in early 2018, and subscribe to all the latest PureCloud release notes at Help.MyPureCloud.